To a certain extent I’m reserving judgment on The Devil’s Whore(Channel 4), because I think the plot is going to take some serious turns next week. But, so far, it’s better than I expected. It’s history-lite, sexed-up for the public – of course – but if that makes it more appealing, that’s not necessarily a bad thing. 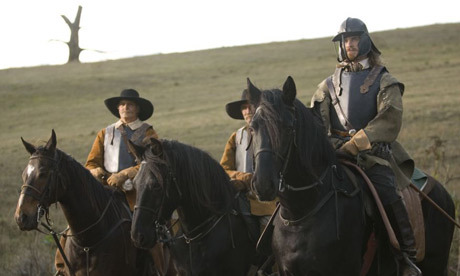 It’s a period in history rarely touched by TV – and not that much by novelists either – so it’s good to see something different (ie not involving Henry VIII or Elizabeth I). It is a particularly interesting period of history; however, The Devil’s Whore doesn’t do that justice, since a lot of the actual war is skipped over – the first episode goes from pre-war to just before Charles I’s arrest, making little of the nature of regicide, the debates of political and religious freedom, and the horrors of civil war. This is because of the focus on the fictional Angelica Fanshawe, she who has an understanding with the devil, apparently. Andrea Riseborough is very good – she has a perfectly 17th-century appearance that I wouldn’t have expected from her previous performances. Since this revolutionary – in all senses of the word – period in history is often overlooked, I think the drama of The Devil’s Whore may be just the thing to pique people’s interest. I certainly hope so, and I hope we get to see more revolutionary politics rather than more corsets in the next episode. This certainly makes a dramatic change from the usual “period dramas”. I quite enjoyed it even though it wasn’t 100% historically accurate. Hopefully it also had some educational value for those that aren’t aware of that part of history.